Accessibility. When building apps, you should always keep in mind that not all users will have a perfect vision. Voice control makes operating the app easier for users with visual impairments. Safety. A hands-free interface is a huge convenience, e.g. while driving a car or performing any other task that requires both hands and a high level of concentration. With the help of voice control, your app can be operated by more users at any time. Interaction. When building machines such as robots and moving vehicles, speech-recognition enables the user to communicate and control the devices easily. This is a very specific case of voice control implementation. 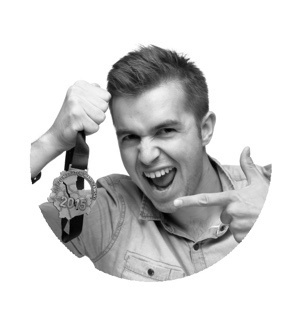 To help you familiarise yourself with the topic, I’ll introduce you to the whole process. First of all, you need to understand the difference between speech recognition and natural language processing. Speech recognition converts the spoken word to written text. Using a speech-to-text (STT) engine, you can dictate messages or emails to your device and then send them. You can also use text-to-speech (TTS) techniques to imitate the voice. For example, with Google Translate’s TTS, you can check how a word is supposed to sound. Natural Language Processing is a much more advanced field of computer science that is concerned with understanding the meaning of the user’s phrase. It uses artificial intelligence and machine learning to catch what you actually meant when you spoke to the device. If you want your app to let the user order a pizza or book tickets on the next flight to Hawaii, it needs a natural language processing engine. The app can only help you when it understands the true meaning of your request. It should not only HEAR you but also UNDERSTAND you. Set a wake-up word (“Lucy”). The ideal solution should have a built-in feature for setting a custom keyword, which allows us to leave the push-to-talk button behind. Answer open questions. This feature is connected to the application’s ability to recognise natural speech and respond to the request with an action. Return a voice answer. The ideal solution should have a built-in “text-to-speech” engine. It should return an out-loud answer to questions and requests. Return JSON code. This code could be used later to communicate with other applications. We’ve compared the following technologies: PocketSphinx, Project Oxford (Microsoft), Alexa (Amazon), Google Voice Interaction, wit.ai, api.ai, IBM Watson, Nuance, and Sensory. The most difficult issue mentioned above is the first one: setting a custom wake-up word. We don’t want to use a cloud service for this feature because the continuous connection with the Internet will negatively affect battery life. Instead of cloud services, we use PocketSphinx - an open-source solution for Android. We are using PocketSphinx as an offline solution only for keyword recognition. Later, we’ll require some cloud service to handle the request. With Sphinx, it is possible to set a custom wake-up word. Sphinx works offline (lower battery consumption). PocketSphinx is not accurate enough to get the effect we want to achieve. It reacts not only to the “Lucy” wake-up word. There is a pause after Sphinx recognises a keyword and launches the cloud service. Project Oxford is a speech-to-text engine from Microsoft. It works well enough, but we need to implement additional API’s to achieve the desired functionality. Powerful in combination with LUIS (Language Understanding Intelligent Service) and CRIS (Custom Recognition Intelligent Service). At the moment, we have a beta version of LUIS and CRIS, and we do not recommend using beta versions for commercial products due to stability concerns. We have to manually implement intents. "Alexa" is the wake word that starts the conversation. "Ask...to" is one of the supported phrases for requesting a service. "Lucy" is the invocation name that identifies the skill we want (in our case it’s the name of our app). "Say hello world" is the specific request, question, or command. Alexa provides a set of built-in skills and capabilities available for use. Examples of built-in Alexa skills include the ability to answer general knowledge questions, get the current time, provide weather forecast information and query Wikipedia, among others. Returns an mp3 with an answer. 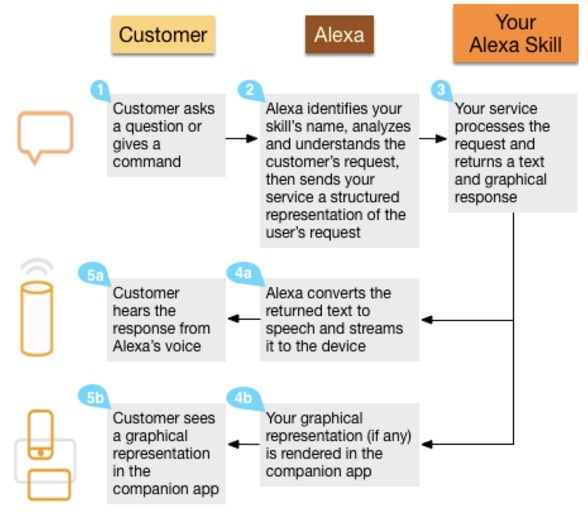 To get custom intents within AVS, it is necessary to create, register and test them with the Alexa Skill Kit. To capture the user's utterances, the device needs to have a button to activate the microphone (push-to-talk). We’ve contacted Amazon and got information that far-field voice recognition or using a spoken word to trigger activation of the Alexa Voice Service is currently unavailable. Handle the intent in the app. Update the completion status of your app. Android will open its default search engine. The user speaks a keyphrase that is matched to our app’s intents. It will launch the application and handle the intent. Provide a sentence we want the app to understand. Then either select an existing intent from the Community or create our own. Send text or stream audio to the API. Wit.ai gets structured information in return. Wit.ai learns from usage and helps improve configurations. Already has a large number of built-in intents. Ability to learn from the user. Not stable enough. During the test, it was shut down after 30 sec. Not so comfortable to use. The Api.ai platform lets developers seamlessly integrate intelligent voice command systems into their products to create consumer-friendly voice-enabled user interfaces. We made a test application using Api.ai, and it was closest to Amazon Echo regarding the quality. Easy to implement, clear documentation. Ability to learn and adapt (machine learning). Complete cloud solution (only without keyword activation): Voice recognition + natural language understanding + text-to-speech. It has only push-to-talk input. IBM Watson is a powerful tool for machine learning and analytics. Basically, it focuses on analysing and structuring data and has speech-to-text and text-to-speech solutions. It is good for big data analysis, but it doesn’t fit the purpose of our application. Nuance provides many voice recognition and natural language processing services. It has a ready solution for mobile speech-recognition: VoCon Hybrid, which could solve our most difficult issue - custom keyword recognition. Always-listening mode with keyword activation removes the need for a push-to-talk button - a key advantage of this technology. All-inclusive main menu (a1M). Enables all commands to be spoken in a single utterance on the main menu. We want a similar interface. Closed technology. It is not an open source API - if you want to use it in your project, you need to contact Nuance and ask for samples to test it. Complicated documentation and set-up. We got the sample of this solution to test, and we were unable to launch it and make it work. This solution requires additional time for testing. Sensory is another expert in the speech-recognition field. TrulyHandsfree is one of the solutions they offer and it looks promising. It is a good alternative to PocketSphinx, and we recommend it if you want a high-quality application. Unfortunately, it’s not free. Always-listening mode. With TrulyHandsfree you can set up a custom wake up word. High accuracy. The technology can respond to commands delivered from as far as 20 feet away or in high noise conditions. Ability to include pre-built commands. This is a great feature, you can set predefined commands, and there’s no need for an Internet connection to handle them. Closed solution. If you want to set a custom keyword, like “Lucy”, you need to contact Sensory. This solution solves only our first issue. It does not include a natural language processing engine and requires other services to handle complicated requests. The Google Voice Interaction API and Alexa Voice Service provide similar functionality. It is possible to launch an application and make an intent through their systems, but it’s impossible to customise it the way we want to. With these services, users will communicate mainly with Google and Alexa and not with our application. We believe that it is better not to use these solutions as they don’t allow us to build a strict connection with the application as an independent product. Api.ai and wit.ai work in a similar way; they solve open questions and can return JSON code. We did tests and made a demo application and decided that Api.ai is better as it is more user-friendly, works smoothly and provides us with ready solutions for voice recognition (text-to-speech), natural language processing and text-to-speech. We built a test application and obtained appropriate speech-recognition functionality. Unfortunately, Api.ai only uses a “push-to-talk” approach. An all-inclusive main menu (enables all commands to be spoken in a single utterance on the main menu). Multi-lingual and partial phonebook name selection (recognises partial contact names for multi-lingual phonebooks). Natural language understanding (recognises natural speech, eliminating the restriction to predefined commands for all VoCon Hybrid languages). However, Nuance technology is not available for free usage, and if we want to use it in the project, it is obligatory to contact them. Sensory’s TrulyHandsfree is a great alternative to PocketSphinx, but it is also not free and fulfils only one item on the list of requirements. At this point, api.ai has the best result in tests, and we would recommend its use as a cloud service for voice recognition and natural language processing. One of the biggest advantages of this service is that it is a ready to use the product, unlike the other cloud services. Api.ai allows us to use an easily integrated solution. Use Sphinx as an offline solution, and make efforts to get it working as well as possible + api.ai for speech-recognition. 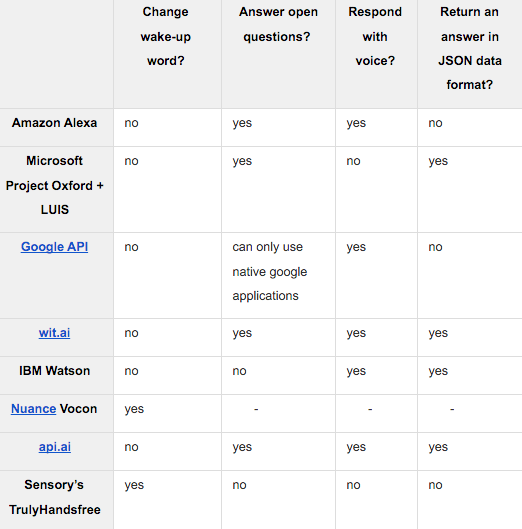 VoCon Hybrid from Nuance - as a ready solution for wake-up word + api.ai for natural language processing (answering open questions and returning voice answers). Use Sensory’s TrulyHandsfree for wake-up word recognition + api.ai. Use a hardware solution for keyword detection. Implementation of a hardware solution could increase the quality of wake-up word detection; then we could use api.ai. We hope this article gives you a comprehensive introduction to the speech-recognition and natural language processing solutions available at the moment. If you have any questions, doubts or suggestions - don’t hesitate to leave a comment!